If a child places the soft, pliable plastic dart in his or her mouth, the child is likely to choke/aspirate the dart into her or her throat, impairing his or her ability to breathe. If the dart is not immediately removed, brain damage or death can occur. 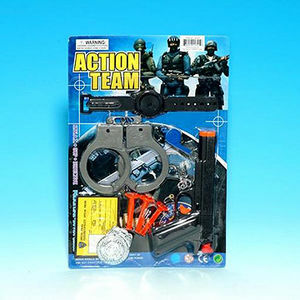 This recall involves about 22,000 "ACTION TEAM" play sets that have a toy gun with three soft rubber darts, a S.W.A.T. watch, baton, walkie-talkie, whistle, and badge with a clip and an identification card. The soft, pliable orange plastic darts have a nearly 2-1/2"-long shaft and an approximately 3/4"-diameter suction cup. The toy gun is black with an orange nose and trigger and red spring release mechanism. "Made in China" is printed on one side of the barrel. Discount department stores nationwide from December 2006 through March 2008 for about $1. Immediately take the recalled dart gun sets away from children and contact OKK Trading to return the toy for a $3 bounty. OKK Trading will provide a free postage paid envelope for consumers to return the toy. For more information, contact OKK Trading toll-free at (877) 655-8697 between 8 a.m. and 5 p.m. ET Monday through Friday or visit www.okktrading.com.